Roberto Malinow, neuroscientist at the University of California San Diego, was awarded the Ariëns Kappers medal. 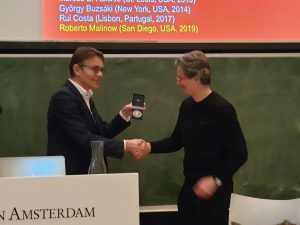 He was presented with the medal by Pieter Roelfsema, director of the Netherlands Institute for Neuroscience. Malinow was awarded the medal because he makes an outstanding contribution to the advancement of neuroscience with his research into the brain’s ability to form and store memories. Together with his lab, he examines how brain activity controls the communication between neurons, which is thought to underlie the formation and storing of new memories in the brain. Disruptions in this process could play a role in the development of several brain diseases, such as Alzheimer’s disease. With his research, Manilow hopes to take steps towards treatments that prevent these diseases.